Most of the time we behave unthinkingly, which is to say by habit. 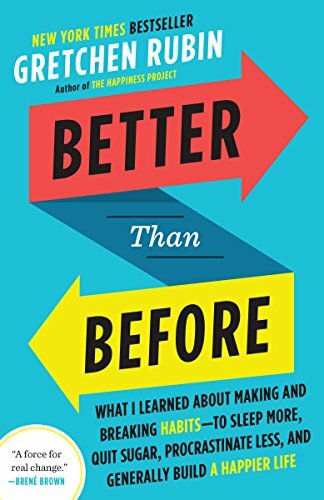 Habits define our existence and our future, says Gretchen Rubin in Better Than Before: Mastering the Habits of Our Everyday Lives. If you accept that we repeat 40% of our behaviors every day, that they are the “invisible architecture of our everyday lives,” then what she says should give us pause. Rubin is best known for The Happiness Project and her blog along the same subject. She is obviously an intellectual powerhouse, having clerked for Supreme Court Justice Sandra Day O’Connor and started her career in law before becoming a full-time writer. She is an aggregator rather than an originalist in the sense that The Huffington Post is. Realizing that one size doesn’t fit all, Ruben has surveyed the considerable research and opinion about happiness and habit change. Seeing how many different strategies exist (she counted 21 viable approaches), she developed a vocabulary of her own and concluded that in order to change our habits we first have to know our individual nature. “Upholders” fulfil expectations, both their own and those of others. “Questioners” act according to their own judgment and don’t do anything that doesn’t make sense according to their inner compass; they don’t like to be told what to do. “Obligers” dutifully do what is expected and don’t like to let others down, but typically let themselves down instead. “Rebels” do what they want when they want it. The more anyone tells them what to do, the less likely they are to do it. People with different tendencies respond best to some strategies and not at all to others, says Ruben. Regardless of one’s classification on her ad hoc scale, seven habits account for the overwhelming majority of those that people wish to change: eating and drinking, exercise, managing money, rest and relaxation, productivity and procrastination, decluttering and simplifying, and improving relationships. The book at least gets people to think about their behavior, attitudes, and assumptions, a first step for anyone wishing to change. It also doesn’t shy away from difficult questions such as why it is easy to form a habit that we don’t enjoy but hard to form one that we do; why dieters typically regain back lost weight and then some; why bearing the negative consequences of unhealthy habits fails to move most people. Rubin hopes to get us out of ourselves and turn old ruts into new roads. But will her recipe that combines research, personal anecdotes, and social media feedback prove superior to existing advice, or will it fall like a failed soufflé? Given the enormous self-help literature on happiness and habit, I don’t favor the odds.